Imagine you are a young salmon. You hatched from a small egg last winter, and competed with your siblings to feed on insects to grow big. Now, at four months old, a variety of signals (warming water, longer days, changing hormones) are telling you it is time to leave your home in the river, and embark on an epic journey—to travel downstream to the Pacific Ocean where food and space are plentiful. The journey will be perilous as fish predators hide behind river bends waiting to gobble you up, but there is no turning back…it’s in your genes, the ocean is calling, and you must go! How do young salmon avoid predators while on their migration journey to the ocean? Salmon are amazing animals and are important economically, recreationally, and culturally. Populations in California are in decline, and many salmon die while they migrate to the ocean, which is why it is important to learn how young salmon avoid being eaten by predators. This is the question motivating my research. To address this, I ran an experiment where I timed young salmon swimming downstream through an obstacle course with and without a predator in their way. I wondered… will salmon change their speed when faced with a predator? Slow down to be cautious? Speed up to get past quickly? Not change speed at all? The obstacle course was a 7-foot long tunnel which emptied into a net pen at the river’s downstream end. I performed surgery on young salmon to insert electronic tags into their bodies. These tags were detected by circular antennae as the salmon swam down the tunnel. Each salmon was timed swimming through the tunnel without a predator, recaptured and then timed with a predator in the way. The predator? A plastic replica of a largemouth bass. I raced three types of salmon contestants through my obstacle course. All three groups were different shapes and sizes, and had different life experiences growing up. Hatchery salmon were born and raised in a fish hatchery. Wild-migrating salmon were born and raised in the river, but were caught while already migrating downstream. Wild-rearing salmon were also born and raised in the river, but had not started migrating yet and were still living on the floodplain. Wild salmon slowed down when faced with a fake predator, but hatchery salmon stayed the same speed! Growing up in the river, wild salmon are better educated about predators. 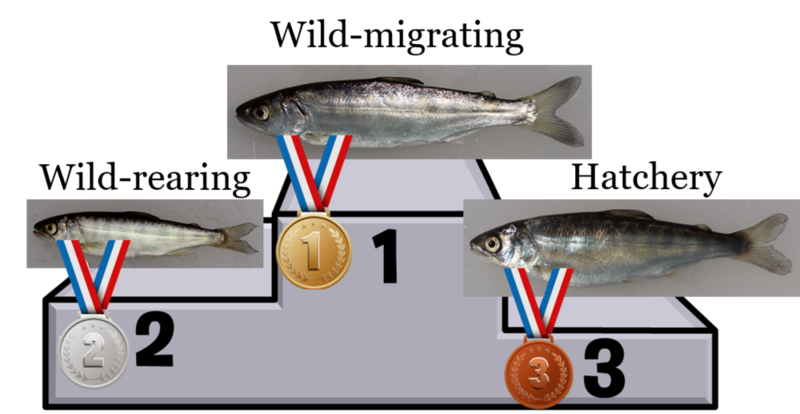 This may be why they react more strongly to the largemouth bass in the obstacle course than hatchery salmon, which have never seen a real predator! In nature, slowing down might be beneficial if salmon hide in habitat cover, become less conspicuous, or allow time to assess the predation threat. 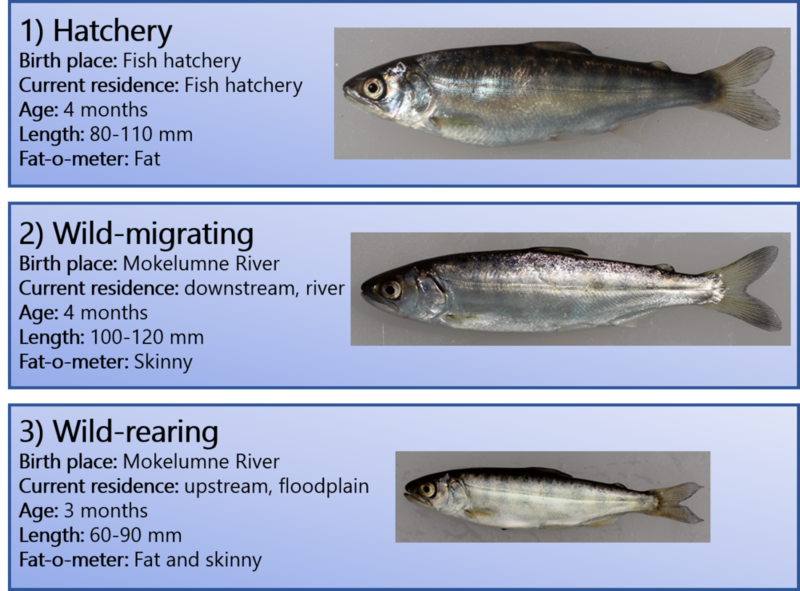 Wild-migrating salmon were fastest overall! Wild-migrating salmon were the biggest, strongest, and were ready to move! As salmon grow up, signals tell the young salmon it is time to leave their home in the river and move to the ocean. These wild-migrating salmon were already on their journey to the ocean. This could be why they were the quickest. This experiment showed that predators may affect salmon migration speed. Since salmon need to reach the ocean when food abundance peaks in late spring, changes in migration speed, and hence arrival time, may affect salmon survival. Also, hatchery salmon may be more vulnerable to predation because they do not react to predators in the same way that wild salmon do. Wild salmon were faster overall, but slowed down when faced with a predator suggesting they are more strategic with their downstream movements. Ultimately, salmon reactions to predators during migration and the interactions between hatchery and wild salmon can affect the survival of juveniles and consequently population sizes of adults. The more we understand about these amazing fish, the better we can protect them! Megan Sabal is a PhD student in Ecology and Evolutionary Biology at UC Santa Cruz. Over 90% of the world’s freshwater and 200 feet of sea level rise are held in Antarctic ice sheets. Ice shelves, structures of floating ice that are at the fringes of the ice sheet, slow the flow of Antarctic ice into the sea. When ice shelves thin or break into icebergs, the ice behind them accelerates, leading to sea level rise. 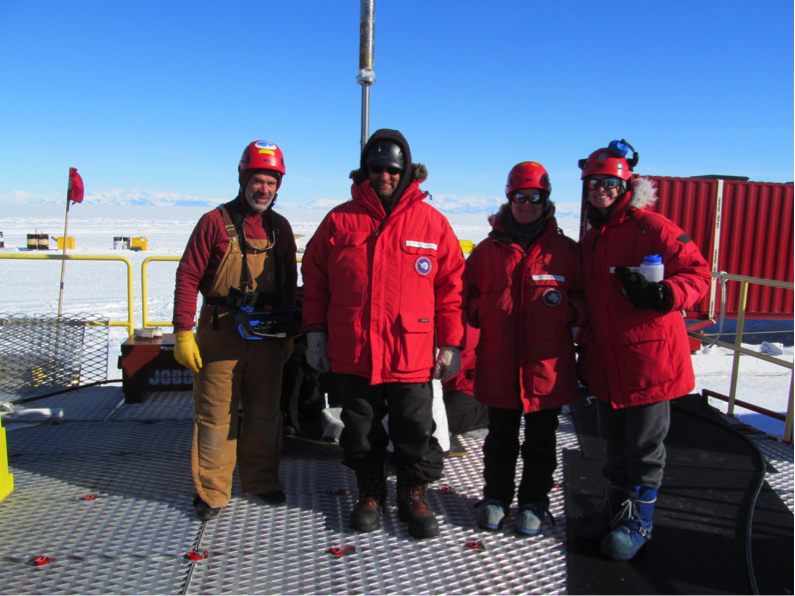 The author (right) and colleagues on deck in Antarctica next to a half-mile-thick borehole through an Antarctic ice shelf. Because ice shelves are so important to sea level rise, we have been monitoring them closely, at least from the surface. When an iceberg the size of Delaware broke away from the Larsen C Ice Shelf in Antarctica, scientists and the public knew about it almost immediately. Satellite images of the ice shelf were collected every 6 days by the European Space Agency, and these images made it easier to detect the changes that were happening. We watched as the crack at the surface of the ice shelf spread from 2010 to 2017. We could see ponds of water collect at the surface when air temperatures rose above freezing, and we could even see liquid water in snow cover on ice shelves with satellite microwave detection. Antarctic ice shelves face an existential threat not only from above, due to atmospheric warming from climate change, but also from below. Approximately half of the ice that enters an ice shelf ends up breaking off as an iceberg. The rest melts off the base of the ice shelf, which touches the ocean water. Although satellite and radar technologies can measure with how fast this bottom melting is happening, the ocean conditions that cause ice shelves to melt often remain elusive. In the Southern Ocean, circulation patterns and the temperature and salinity of water masses have been changing in recent decades due to climate changes. Scientists think it is becoming easier for warm water masses to flow beneath ice shelves, which could increase the rate at which ice shelves melt. However, ocean monitoring below ice shelves has been limited because it is incredibly difficult to sample below the ice. To do so, we need to create a hole in an ice shelf to lower an instrument to the ocean waters. In January 2015, a group of scientists that I was a part of did just that – we melted away a narrow hole in half a mile of ice to access the farthest reaches of the largest ice shelf in Antarctica, the Ross Ice Shelf. I found that the temperature and salinity of the ocean water that we observed was different than it was when it first flowed underneath the ice shelf, which might give us clues about ice-shelf melting and future sea level rise. It’s hard to piece these clues together because there are only four observations below an ice shelf the size of Spain. Only four observations of the ocean below the Ross Ice Shelf have been collected in the last 40 years. The Whillans Ice Stream Subglacial Access Research Drilling (WISSARD) project drilled the most recent hole to the ocean cavity below the Ross Ice Shelf. Right: an aerial photo of the WISSARD field camp. Although the ocean waters beneath some ice-shelves have been sampled more frequently, in general, these environments remain woefully under-sampled. Exciting technology has emerged that would allow us to monitor much more of the waters below the ice-shelf at comparatively low cost. Small, remotely-operated submarines have been sent to explore beneath the ice shelf of Pine Island Glacier, where the most rapid ice loss in Antarctica has occurred. We need to do the same for other ice shelves to assess this second emerging threat from climate change, changes in the ocean water masses that flow beneath them. The international community should develop a monitoring program for ice shelves to capture melting from the surface and underside. This is a necessary step to improve sea level rise predictions. Carolyn Branecky Begeman is a PhD candidate in Earth and Planetary Sciences at UCSC. She has spent two field seasons in Antarctica and one in Iceland. She collects observations in hard-to-reach places and uses computer models to milk the most knowledge from these observations. Learn more at carolynbegeman.weebly.com. Our boat pulled at the mat of giant kelp I had used to tie the bow line, drifting closer to the man’s kayak. The fisherman motioned to a few rockfish and told us that he was angling for a bigger prize: a cabezon, or better yet, lingcod. I hold a baby rockfish before taking a very small tissue sample for genetic analysis. Dozens of fish wait their turn in the bucket below (Photo: Diana Baetscher). We were having good luck catching rockfish too. But rather than taking the fish home for tacos, we snipped a tiny piece of fin, tucked it into an envelope, and released the fish back into the cold water of Carmel Bay. These fin clips contain DNA that I use to match adult rockfish with their babies by a rockfish-paternity test that I developed as part of my graduate research. It might seem like a strange goal – finding matches between adult rockfish and their offspring – but our aim is to understand where baby fish end up when they are born in a marine protected area (MPA). Our method works because the adult rockfish we study are nearly stationary: they move approximately 100 square feet during their entire adult life. Baby rockfish, however, are pushed around by currents, wind, and waves. No one knows how much control these tiny fish have over where they travel, and ultimately, where they end up. Baby rockfish drift and swim under the cover of the kelp canopy in Carmel Bay, California (Photo: Laughlin Barker). Ten years ago, scientists and policy-makers designed MPAs along the coast of central California to provide protected habitat and increase populations of fishes favored by fishermen. Research at that time suggested that many of the baby fish within the MPAs would leave and increase fishing opportunities. Other baby fish would stay inside the reserves and grow the population. Carmel Bay includes two such protected areas and we sample adult and baby fish both inside and outside these MPAs. But we needed a way to test where the baby fish are going. With DNA from thousands of rockfish, I look at dozens of genes, and in those genes, hundreds of individual base-pair differences: the single molecules that make each person – or fish – unique. This is how researchers compare bits of DNA that we have in common with our parents and siblings, but not with folks that are unrelated to us. And this is how I track down parent-rockfish and their babies that stay in Carmel Bay. Single-molecule differences in the genes of fish (and people) allow researchers to match parents-and-offspring (Graphic: Diana Baetscher). My research tests whether baby fish stay in the marine reserves where they are born and increase local populations, or settle outside of MPAs and boost fishing opportunities. My results studying rockfish in Carmel Bay suggest that fish might do both – some stay near their parents and others travel miles away. A combination of movement patterns keeps fish populations healthy and supports fisheries. We catch another rockfish and wrangle it onboard, avoiding the sharp spines. I snip a tiny piece of fin tissue, and release the fish along the side of the boat, where it quickly swims beneath the kelp. I tuck my tissue sample into an envelope. Back at the lab, the DNA from this fish will provide some of the clues needed to track fish movement and ultimately allow us to manage our coastal fisheries sustainably. Diana Baetscher is a PhD candidate in Ecology and Evolutionary Biology at UCSC and the Fisheries Ecology Division of NOAA’s Southwest Fisheries Science Center. In the bottom of every healthy stream are millions of insects. For the most part, these insects are tiny, with bodies could fit on a thumbtack. This may not be exactly what everyone likes to picture when they think of a peaceful, meandering stream, but this life is what keeps our streams clean. These tiny aquatic insects digest dead leaves, graze on algae, filter fine particles out of the water, and provide food for birds, bats, amphibians, and the many species of fish that capture people’s imagination. In coastal California streams, I have sometimes counted densities of up to fifteen thousand insects per square meter of stream bottom, from over 50 distinct insect families. ...or this juvenile caddisfly with hairlike gills on the underside of its body, are largely unknown but important indicators of stream health. Scientists use these insects to learn about stream health. Aquatic insects are so numerous and diverse that by simply observing the numbers and kinds of insects in a stream, we can infer what types of stress a stream may be experiencing. For example, some insect species tend to increase under human-induced stresses, such as nutrients from fertilizer runoff, while other species become rare or disappear entirely. In California, stressed streams may have high numbers of blackflies, or few insects of any kind, while healthy streams have many different types of insects, including stoneflies, mayflies, and caddisflies that serve as the food source for trout and salmon. I study aquatic insect life in the beautiful green valleys of Marin County, where cattle ranching has been the dominant land use for over 150 years. Many ranchers there are descendants of families that began raising cattle in these same locations just after the Gold Rush, and many describe land stewardship as a key motivating force in their lives. However, grazing can allow fine sediments to leach into the stream as cattle disturb and expose the soil; the increase of sediment in streams can then lead to loss of habitat as settling particles cement over the tiny nooks and crannies that fish and insects use. In response, ranchers often plant strips of trees along their stream banks to improve water quality, a technique that can also slow erosion and flooding, further benefiting aquatic life. An example of a stream with no trees in Marin. These streams tend to have fewer insect species, an indicator of stream stress. Cows can trample the stream bank, causing erosion and increased stream stress. Tree restoration projects like this protect the stream banks from trampling and erosion, which can benefit insect communities! While there is good evidence that wider tree plantings and strategic tree placement can lead to improved stream health, we don’t know whether planting trees along longer sections of streams can have the same benefit. Benefits might include shading and cooler water, more tree roots and fallen branches to hide under and feed on, and bigger connected patches of good stream habitat. With the help of many interns, I collected and identified thousands of insects across Marin County to see how insects responded to tree plantings that extended different lengths along the stream banks. While many features of the stream, including the texture of the stream bottom, were the same from top to bottom of a strip of trees, I found that the insect communities improved with longer strips of trees. More sensitive insect species were able to live at the downstream end of tree plantings, most likely in response to subtle changes in water temperature, fine sediment, and flow associated with the trees lining the banks. This information is important, because it shows that ranchers can improve the effectiveness of their restoration efforts by planting longer runs of trees, even in cases where they aren’t able to create wider swaths of trees. Curious cows are an important part of the history and economy of Marin. Their curiosity often makes field work more challenging - this cow chewed through the measuring tape we were using for sampling! Longer stretches of tress, such as the established stream side trees shown here, can protect the streams. Stream work can be tricky - here I am waist deep trying to measure tree cover in Marin County. Insects are important both because they show us how stream condition is changing, and because they directly support the entire aquatic food web: they are fed on by birds, bats, and baby fish, and these in turn feed bigger fish and (in the case of Marin streams) river otters. This ecosystem snapshot can help managers decide which efforts actually succeed in improving stream health. And if people get excited about the secret world of aquatic insects in the meantime, that’s fine with me. Bronwen Stanford is a PhD candidate in Environmental Studies at UCSC. A common sight our SCUBA divers encounter while surveying moray habitat! Lions, and tigers, and bears! Oh my! These large animals have long fascinated, if not scared, humans. Of course, the allure of such large predators doesn’t stop at the water’s edge. Stories about enormous sharks, massive squid, and other apex predators that roam the oceans are deeply rooted in human history and vary depending on culture. Personally, I thought I was receiving sound advice during my childhood when I watched the film, “The Princess Bride,” and Vizzini warned the princess, “Do you know what that sound is, highness? Those are the shrieking eels!...They always grow louder when they’re about to feed on human flesh!” As long as these stories have been told and these films have been made, the populations of these large animals, often considered apex consumers (because they eat a lot and not a lot eats them) have been collectively declining across different ecosystems, both above and below the water’s surface. In fact, we are starting to see a pattern across a range of landscapes; populations of these large consumers are extremely sensitive to climatic and anthropogenic changes. Over the past few decades, ecologists have become increasingly good at connecting the dots between large consumers, their prey, and their ecosystems. We have repeatedly come to a the same conclusions – the presence or absence of apex consumers have the ability to drastically shape the environment around them through food-web interactions. Occasionally, the connection between apex consumers and their associated ecology are so firmly entwined, that just a decline in their abundance ignites a trophic cascade – a series of changes in the strengths of species’ interactions that trickle from the “big bad wolf” at the top of the food web all the way down to the very grass in which it takes its nap. It is therefore critical to understand these multidimensional connections between apex consumers and their environments. The problem, though, is that before we can begin to study these relationships, we must understand the biology and ecology of these consumers by first asking logical life history questions about them, as the answers can greatly influence community structure and therefore, entire ecosystems. Surprisingly, such logical questions (e.g., how many there are, where they live, how much they move, what they eat, how old they can be) were left unasked about a likely apex consumer that lives in kelp forest communities, one of the most studied ecosystems in the ocean. But because of their cryptic lifestyle they have managed to remain virtually undetected in standard species surveys, and thus have been left unstudied. Being able to study the life history of a predatory fish and begin to answer all these questions was great news and very exciting as an incoming doctoral student. The bad news, however, was that I would have to stop listening to Vizzini’s advice. Our SCUBA team preparing for an afternoon under the waves as I motor them across Two Harbors to survey the habitat of the California moray eel. 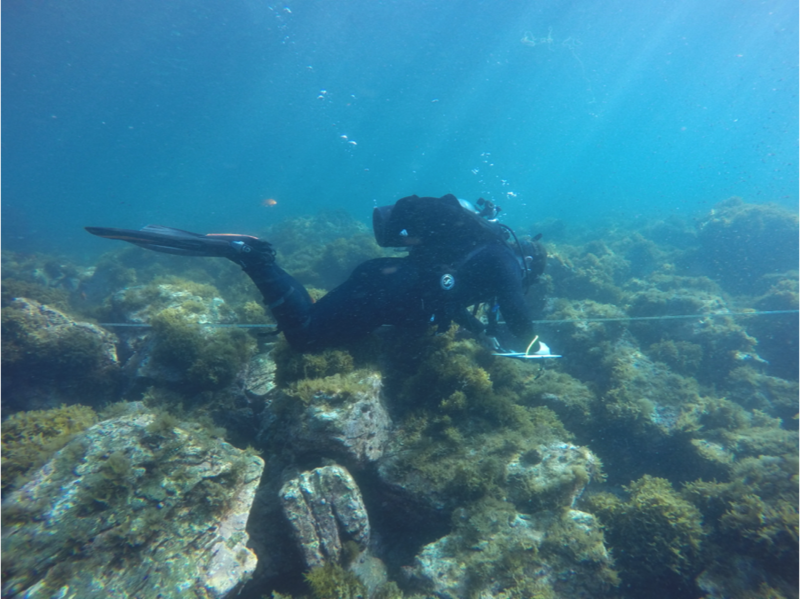 Using an underwater slate and transect tape to determine how much of the habitat is made up of different substrates, such as boulder, cobble, sand, or bedrock. These data were used to see if moray abundance could be determined by the type of habitat in Two Harbors, Catalina. A California moray emerging from a crevice between two boulders to explore one of our traps not long after it was deployed. You can see the bait canister toward the top left of the image. It takes a lot of work from a lot of dedicated people to collect the ecological data for the California moray eel. Each summer our team travels Two Harbors, Catalina Island to trap, tag, and measure the resident moray populations. My research has been focused on studying the functional ecology of the California moray eel. I can tell you straight away that luckily, they don’t shriek. The rest of my results have come from a wide range of field and laboratory methods that span from Santa Cruz, to Catalina Island, California. Each summer a pack of us descend upon Two Harbors, Catalina Island to trap, tag, and measure of the California moray populations. Over the course of the past 5 summers, we’ve tagged over 1000 individuals, and each time we go back to those same coves, we continue to find new individuals. On top of these incredible numbers, we’ve learned that the California moray moves very little, grows slowly, lives a long time (at least 22 years) and consumes many different types of prey. All of this combined suggests that the California moray eel is an apex consumer that likely plays an important role in its ecosystem. Much like the abundance of wolves affects that of the grass, the abundance of California morays likely influences a multitude of traits that so many of us find pleasing about kelp forests, such as the many different types of fishes observed on a weekend snorkel. Another result that has come from my research, is that even the mere presence of California morays on Catalina Island appears to be tied the occurrences of El Niño events, a significant force that has impacts all over the planet. Using the otoliths (inner ear bones of fishes) of 33 morays, we were able to count how many years they spent in the coves of Two Harbors. To figure this out, we looked at growth deposits on these tiny bones. The analysis is very similar to that of aging a tree – each year can be visible if you look close enough. Then, we simply back-calculated the age of the moray to the year it settled to the rocky reefs of Two Harbors. What we found, was that 30 of the 33 (91%) individuals we looked at, settled in Two Harbors during years when Southern California was experiencing an El Niño. This suggests, that morays use the changes that El Niños inflict on the water currents to populate Catalina Island. On top of this, more research has shown that the vast majority of climate models indicate that El Niño events will increase in both frequency and severity alongside global climate change. This means that in the future, the California moray could begin to move north along the coast, outside of their historical range, and start to have impacts on populations that would have never had to worry about such an abundant but hidden predator. These changes could influence fish populations that recreational divers and spear fishers also target, again setting the stage for some challenging coastal sustainability issues that span cultural, economic, and recreational values. My work shows that similar to how the lions, tigers and bears influence the environment around them, the California moray has a functional role that also helps shape what we see when we visit the kelp forest rocky reefs of Two Harbors, California – a pastime shared by millions of people each year. It has been 78 years since Dorothy sang that song about her fear of large predators, and although we have made significant progress in understanding the ecology of apex consumers across a range of environments, we are only beginning to grasp the vast ecological challenges and associated consequences that come along with their absence or redistribution as a result of global climate change. Ben Higgins is a PhD candidate in Ecology and Evolutionary Biology at UCSC. Google Earth aerial imagery of Corte Madera Bay, in San Francisco Bay. True color reveals the quantity of mud that moves through the marsh and embayment. At the confluence of fresh, muddy rivers and salty, cold ocean waters, estuaries connect interior lands to the vast ocean. Estuaries are valuable ecosystems, hosting great diversity and large populations of fish, birds, and shellfish. They are also valuable to people, providing food, water, and acting as a first defense against coastal storms and river flooding. Large cities have thrived along the lower reaches of rivers and at the ocean coastline for centuries or, at some locations, millennia. As a result, estuaries are some of the most human-impacted waters in the world. The three largest estuaries in the United States - Chesapeake Bay, San Francisco Bay, and Puget Sound – are surrounded by huge population centers. Even smaller estuaries, such as the Hudson River Estuary, Penobscot Bay, or Morro Bay, are surrounded by major cities and towns that were built on the breadth of natural resources available via the waters. Estuarine habitats sustain many animals, including the osprey seen here in Chesapeake Bay. Photo: Bob Quinn. While people have benefitted from estuaries for generations, we have also had extensive impacts. Since the Industrial Revolution, water has been harnessed by dams for drinking, sand and mud have been dredged and removed for shipping channels, wetlands have been filled to increase habitable space, and fish stocks have been depleted by industrial fishing practices. Foreign materials have been introduced to estuaries by other practices, such as inland mining and logging. Early pollution from industrial water usage and poor sewage systems rendered estuarine waters particularly dirty. Fortunately, local and state-wide measures and the federal Clean Water Act have largely improved the health of estuaries. Nearly every estuary in our country is the focus of an effort to restore these waters to the bounty they once were. However, many estuaries remain heavily impacted. Many estuaries are still sediment-starved from dredging and upriver damming, meaning that less mud is available to build marshes and wetlands, and less sand exits estuaries to sustain coastal beaches. Despite regulations that decrease modern pollution, relic contaminants, such as mercury or polychlorinated biphenyls (PCBs), are chemically bound to the mud and, therefore, transported or deposited with the sediments. Understanding the physical processes at play in estuaries can focus restoration efforts to increase effectiveness and economic feasibility. Relic contaminants from early, unregulated industry are often bound to muddy sediments, so they persist for a long time in estuaries. This image is from the Petitcodiac River Estuary, which feeds in to the Bay of Fundy in Canada. I am interested in how tides and currents distribute sand and mud throughout estuaries. Though many scientists have observed these processes in estuaries across the planet, measurements are limited to single points over discrete time periods because of the difficulty and expense of spending time out on the water. Instead, my work uses a numerical model that represents an estuary, with fresh water flowing in from the river and salt water flowing in or out with the tide from the ocean. A numerical model uses physics equations to simulate how water flows around the estuary. Models like mine help fill in the gaps in our collective knowledge gained from decades of observational studies and, in this case, can be used to generalize how tides and currents affect mud residence time in estuaries. Residence time refers to how long something stays in a system. For mud with pollutants bound to it, the residence time allows me to identify areas that might be hotspots for relic contamination. Using the model, I am also able to identify conditions under which mud and sand could be deposited on top of existing marshes, helping them to grow vertically to combat sea level rise. Furthermore, I can anticipate how changes in river flow or other physical conditions over time will impact mud distribution in the estuary. My undergraduate advisor, Gail Kineke (Boston College), and I pump sediment-laden water off the top of a core of mud along the Louisiana coast. This early research inspired me to pursue estuary dynamics further. As children, we’re often kept from playing in the mud. My research has put me in situations that would horrify any mom: I’ve walked through marshes where the mud comes above your knees; I’ve pulled buckets of mud with worms and algae onto decks of rocking boats; I’ve even smelled mud to approximate how oxygen-depleted an estuary was. By combining these observations with a numerical model, my research helps us better understand the forces that transport sand and mud in estuaries to predict the fate of relic contaminants or marsh growth. My research feeds into the extensive restoration efforts occurring around the country to return these valuable waters to healthy ecosystems that can sustain both human and wildlife populations for centuries to come. The calm waters that serve as the backdrop for one of the most photographed greens in the world at Pebble Beach (left) belie the constantly moving currents in Carmel Bay that control where kelp rockfish (above) call home. Photo credits: B Sanders and A Lowe. Pebble Beach golf course was ranked #14 on the list of Top 100 Golf Courses Worldwide. Is this golf course really better than thousands of other courses in the area and around the world? Perhaps, but most golfers would likely attribute the breathtaking ocean views as the true reason to visit this course. It is quite a view. You can pause and watch a wave roll in and crash into the rocks, but how does the water move beneath the surface? Let’s start with a unique feature of Carmel Bay – the canyon. Carmel Canyon is one of the steepest submarine canyons off the California coast, and it connects to the Monterey Submarine Canyon system offshore. As a visual reference, the Grand Canyon would fit inside the Monterey Submarine Canyon, and the Carmel Canyon is steeper than both canyons, but not as large. The head of Carmel Canyon is located just off Monastery beach (swim about two pool lengths) and you will be hovering over water about 100 ft deep. This canyon is quite a dramatic feature for such a small bay and influences the water circulation. The circulation during summer months generally flows clockwise in Carmel Bay. Water enters the northern part of the bay and flows out the southern region. Interestingly, the inflow is weaker because it is spread out over a larger region and the outflow is concentrated into a smaller, subsurface jet of strong northwestward flow out of the bay near Point Lobos. The tidal circulation has a strong influence in southern Carmel Bay due to the submarine canyon and results in a strong, concentrated, outward flow. Often, we think of tides as a symmetric process because we can watch the tide go in and out at the beach. But off the beach, the flow does not always “turn around” and reverse, instead it may change directions and develop an alternate flow pattern, which is the case in southern Carmel Bay. Therefore, the tides have a large influence on the circulation and account for about a third of the energy in Carmel Bay. Many fish and invertebrates (like anemones) are found deep in the canyon whereas other species prefer to reside in shallower depths. You may notice kelp floating at the surface in regions – these areas are shallower (less than 90-ft) and house many fish, sea stars, abalone, and other underwater creatures. Within and around Carmel Bay, there are four marine protected areas. The density of marine protected areas in this area highlights the importance of these healthy ecosystems lying beneath the surface. After being moved by the ocean’s currents, baby kelp rockfish settle in the kelp forest canopy where they continue to grow. Photo credit: Paul Mattern. Kelp rockfish are very common in this area. Fun fish fact: a female kelp rockfish releases thousands of baby fish into the water each spring. These baby fish are so small (1-2 mm) they are unable to swim and are moved by the water for about 1-2 months until they can swim. If the circulation transports a baby fish far offshore, it is unlikely to survive, whereas baby fish transported close to the coast are more likely to find kelp forest habitat and survive. Once a juvenile kelp rockfish settles, it moves very little during its adult life (some adults will stay near the same rock!). Therefore, the ocean’s circulation plays a major role in fish population distribution along the coast. 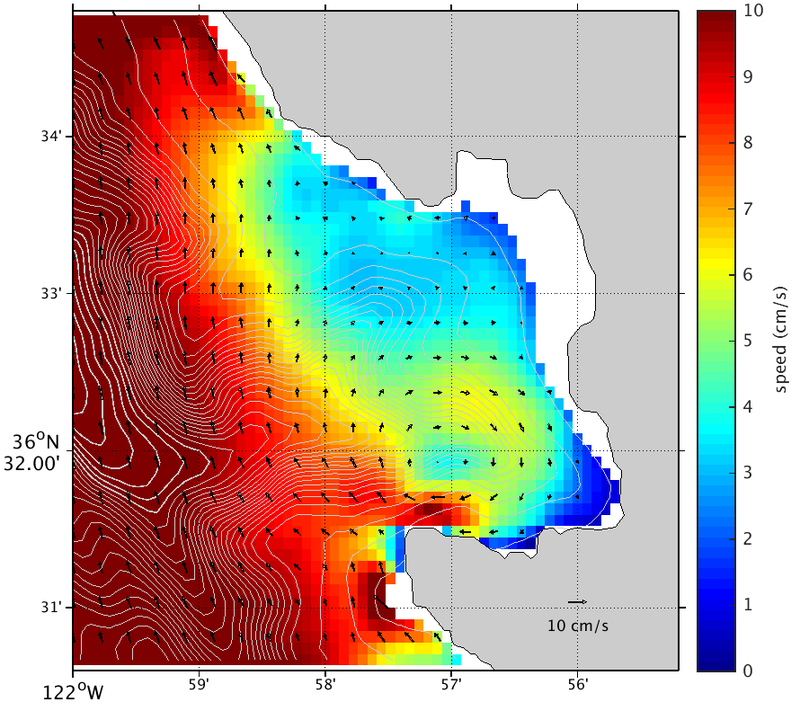 My research uses a model to simulate the ocean’s circulation off the central coast and within Carmel Bay. Then, I seed the model with particles representing baby kelp rockfish to track where they go. Most baby fish released in Carmel Bay go southward along the coast, but some move northward and settle nearby in southern Monterey Bay. Interestingly, there is a strong, subsurface current transporting some of these larvae northward around the Monterey Peninsula. Carmel Bay supports a vibrant underwater ecosystem off the central California coast. Next time you find yourself golfing at Pebble Beach, sightseeing on 17-mile drive, picnicking at Monastery Beach, or hiking at Point Lobos, I hope you remember this brief description of the bay’s circulation and the transport of baby fish that is happening beneath the surface of your incredible ocean view. Anna Lowe is a PhD candidate in Ocean Sciences at UCSC. A starry night of White-faced Storm-petrels. A stormy day on Burgess Island. All six of the island’s mammals are just keeping dry today; poorly adapted to island life, maybe we’re not meant to be here. The thousands of avian and reptilian vertebrate residents, however, are probably just as happy to have drenching rain and 30 knot gusts as calm sunshine, but it tends to throw a slight kink into our well-oiled seabird research machine. Last night, we checked the radar maps to see a large red/pink (meaning hellish) blob of weather headed our way. To affirm our tough reputation as seabird biologists, we spent a few hours in the rain looking for storm-petrel burrows and their residents but before long we were thoroughly drenched, and our fearless leader Chris declared that the following day would be a “Scones Day” - one bit of kiwi English that needed no translation. Be it offshore islands in California or New Zealand, days like this aren’t fit for much other than baking, staying indoors, editing photos and writing. With any luck, the storm should blow over by the end of today, leaving us with a few nice days for the rest of our trip. If I look around the bunkhouse, I could be on almost any island’s research station. There are walls littered with various old maps, photos and biological curiosities, a pile of seabird carcasses by the door, many more spread wings and feathers in the entranceway, dilapidated furniture, more battery chargers than I can count, and importantly, lots and lots of high calorie foods. While indoor, it can look a lot like the Farallones, but a far different seabird soundscape emerges when you step outside. Just down the lighthouse path are Fluttering and Little Shearwater burrows deep in the vegetation, and if one walks a little farther, White-faced Storm-Petrels and Black-winged Petrels have turned the ground into swiss cheese. Hobbling around the ground like bizarre Cassin’s Auklets are Common Diving-Petrels. You must be super careful not to accidently step on the grass tussocks that seem alive with calls. There are a few burrows you could lose a leg in, and those belong to the Grey-faced Petrels I’ve yet to see. Lastly, on lower slopes, large burrows belong to the foul smelling, foul sounding Blue Penguins. A really good kiwi seabird biologist already could tell you where I am by species assemblage, but for the rest; we’re camped out on Burgess Island in the Mokohinau Islands. Measuring growth rates of a White-faced Storm-petrel chick. Buller's Shearwaters and Burgess Island lighthouse. If you’re interested in protecting threatened seabirds, New Zealand is the place to be. Despite it being smaller in area than California, it has over 30 threatened breeding species. Monitoring population trends and evaluating outcomes of conservation actions here is important to saving these species. In fact, some of the most cost-effective actions to protect seabirds in our local marine environment in California depend on protecting breeding habitat halfway around the world. Thankfully, New Zealanders have led the way in island-scale restoration. Burgess Island was one of the first islands in New Zealand to have its rodents removed by the Department of Conservation in 1990, and the island now thrives, rodent free, for over a quarter century. Today these islands support at least 12 breeding species of seabirds (including 7 procellarids! ), endemic skinks, geckos and surely even more invertebrate and plant biodiversity than us bird-centric folks realize. I’m here with five other scientists to investigate how seabirds are faring out here, where they go, and what they do. My own interest is testing acoustic monitoring approaches to measure the diversity and abundance of these remote colonies. By recording night sounds with small inexpensive acoustic recorders we can identify what species live on islands, estimate their relative abundance and seasonal patterns. The nights out here are overwhelming as tens of thousands of birds descend and release all sorts of primitive sounds into the night air. By contrast, even at the species-rich Farallon Islands in California, nighttime acoustic activity is generally restricted to four or five species of seabirds. Recordings here might have twice as many species vocalizing over the course of a single night. Both are a far cry from the single species tern colonies I started working in three years ago! Why research the effectiveness of acoustic monitoring out here? For every accessible island like Burgess, there are many more so remote, fragile or dangerous to visit that we don’t know much about the island’s seabirds. Even on Burgess, we work in only a fraction of the seabird breeding habitat for a few months a year. Island scale information on the diversity and abundance of cryptic seabirds is critical to evaluate how effective our conservation and management actions have been. In a country like New Zealand, with so many endangered seabirds, and relatively few people and resources, there’s a strong desire to embrace scalable tools for population monitoring approaches like acoustics. That night we feasted on mincemeat and sautéed veggies, finishing off with a bread pudding my American taste buds will never fully embrace. Regardless, we finally had a break in the rain and were ready to check out the nighttime visitors. One step out the door and we heard could hear petrels calling overhead. After walking a few hundred meters, we encountered five species of tubenoses! Black-winged Petrels and White-faced Storm-petrels buzzed our heads as we stood on the ridge. My colleagues began “war-whooping”, an improbable but incredibly effective solution to getting a wild bird to land squarely at your feet. Imagine our luck, when the very first bird was one carrying a valuable geolocator tag carrying a year of data about where the winged wandered had roamed! After a few hours, we all returned “fully knackered”; too tired even to dream of the exciting week in store and the looming possibility of rediscovering the breeding ground of the elusive New Zealand Storm-petrel. Abe Borker is a Ph.D. candidate in Ecology and Evolutionary Biology at UCSC. A guest blog by Tye Kindinger, Ph.D. It was like one of those pharmaceutical commercials where the voice-over asks if you’re suffering from a long list of various symptoms in order to reveal a new magical drug that may be able to solve all of your problems. But for the first time, I actually found myself nodding in response to every single question. Imposter syndrome: the marked ability of high-achieving individuals to remain convinced that they are frauds and do not deserve the success they have achieved, despite evidence of their competence. It is a state of mind that is commonly widespread amongst academics, but its existence is rarely acknowledged or openly discussed for fear of convincing others that you are a true fraud. I was lucky enough to learn about the imposter syndrome at a student workshop held towards the end of my first year of graduate school. The speaker had the entire room affirmatively nodding along as he posed each symptom as a question to his audience. Prior to this workshop, I had experienced a lot of those “Toto, I've a feeling we're not in Kansas anymore” types of moments where my naivety towards knowing what to expect in graduate school became abundantly clear. At first, taking classes felt familiar enough, but I quickly realized I was surrounded entirely by people who were brilliant and accomplished. Before I knew it, I found myself feeling intimidated by my peers. Any time I wanted to speak up in class my arm remained glued to the table and refused to be raised for fear of saying something incorrect in my shaky, unconfident voice. But suddenly, this workshop gave me a new sense of understanding and comfort as I realized that what I had been feeling not only had a name, but was very common in academia. Fast forward a couple of years to me banging my head against my desk trying to figure out the appropriate statistical analysis for an undergraduate student’s thesis. Having already devoted what felt like too much of my time to this conundrum, I found myself at a crossroads where I could either (1) continue to delude myself into believing that the answer was just one more Google search away, or (2) admit to myself that I wasn’t the leading expert in statistics and ask for help. So, I swallowed my pride and turned to the free statistical consulting services provided by my university’s statistical department, and a couple weeks later I had my answer. A few of the many roles that make up a scientist, any of which could be an entire profession on its own. That experience lead to an epiphany that has remained crucial for not only progressing in my career, but also for maintaining my enjoyment in this profession. As a scientist, my ability to succeed hinges on a strong knowledge base across a broad range of fields and an unlimited array of skills. However, this essentially boils down to expectations of being able to wear numerous hats, including that of a writer and editor, project manager, statistician, computer programmer, graphic designer, public speaker, accountant, project promoter, etc. Each of these components that makes up a scientist could be an entire profession on its own. So, why is it then that I was holding myself to expectations of being an expert in every single one of these areas? These expectations clearly were not feasible. And, that’s when I realized the value of embracing the imposter syndrome. By acknowledging those moments when I felt like a fraud and facing my weaknesses rather than opting to pretend they didn’t exist (or turn to the “fake it ‘till you make it” mentality), I gradually learned the advantages gained from reaching out for help. I started sharing far-from-perfect drafts of manuscripts with my fellow lab members as a quick fix for writer’s block. Then, I sought help from a computer programmer who worked with me to write flawless R code (without ever having to look up any code) and accomplish in a single lunch break what had only brought me endless frustration for two weeks. And, the possible questions that could be addressed in a collaborative project grew with the addition of a member with expertise in ArcGIS. Today, facing my fears of being an imposter whenever I venture outside of my comfort zone has brought even more than increased productivity. On a personal level, this has included recently accepting a postdoctoral position that initially intimidated me by the lack of overlap with my dissertation research in the focal drivers, study system, and methods. However, viewing this experience as an opportunity to learn and incorporate new ideas and perspectives into my work with guidance from experts in these new fields will ultimately take my research so much further by enhancing my range of possibility than if I had chosen to remain in my comfort zone and simply expanded upon my dissertation. Some of the experts and peers that have contributed to my progression as a scientist. Photos courtesy of Emily Donham (left) and Lillian Tuttle (right). At a much larger level, given the environmental changes that are currently underway at global scales, the types of questions that we (as a society) pose are necessarily becoming more interdisciplinary in nature as the answers increasingly rely on the blurring of boundaries among various fields (e.g., ecology, socioeconomics, conservation, engineering, public health, etc.). While collaboration is not a novel concept in science, the ability to initiate and assemble collaborations (particularly those consisting of fields that typically have not worked together in the past) stems from recognizing when we have reached our individual limits. More than ever, we need to embrace these limits and resourcefully find ways to push past them to arrive at solutions that we may not have considered possible in solitude. Dr. Tye Kindinger is a Postdoctoral Scholar in Ecology and Evolutionary Biology at UCSC. Hungry, hungry urchins: Can changes to grazing rates alter kelp forest ecosystems in a changing ocean? Diving in a kelp forest can be a bit overwhelming at first. The initial shock of cold as you plunge into the water quite literally takes your breath away. You then try to untangle yourself from the grips of the kelp canopy that only seems to tighten as you struggle with your arms and legs made heavy by your thick neoprene wetsuit. Finally, you descend through the forest, and if you’re lucky, you’ll be able to see 30’ ahead. At first this can be disorienting, but the more you do it, the more fun it becomes to use your compass and rely on landmarks to navigate around the reef. Once you reach the bottom, it’s usually much easier to take in all of the amazing critters that live in this underwater forest. There can be schools of rockfish in the water column ahead, brightly colored sea slugs crawling across bubblegum pink algae below, and curious harbor seals making brief appearances. When you are below the canopy, its clear that kelp forests are diverse and bustling ecosystems. Despite the sense of wildness and life that you can feel when you SCUBA dive, kelp forests are still very much at risk from human activities. Anthropogenic carbon dioxide emissions are causing the ocean to warm and acidify. Although ocean temperatures and acidity can vary a little bit depending on the season or the location, the changes brought on by climate change and acidification are much more intense and are likely to impact algae and marine animals that live in all regions of the world's ocean, including the rockfish, sea slugs and calcareous algae found in kelp forests. As a part of the Kroeker lab here at UCSC, my dissertation focuses on how kelp forest ecosystems found along the California coast will respond to climate change and ocean acidification. Kelp forests are dominated by large habitat forming brown seaweeds known as kelps. Kelps provide important habitat and food for the hundreds of species that live within them. These ecosystems are very much like our own bustling cities, made up of thousands of individuals interacting with each other and competing for the resources they need to survive. In this underwater “society,” one of the most important things for survival is making sure that you get enough food to eat. Imagine for a moment that you’ve just gone on a long run and are looking forward to dinner that evening. You will likely plan to eat much more than you would if you had just spent the day working behind a computer. Ocean warming and acidification have the potential to affect marine life in ways that a long workout might affect you. For a sea urchin living on a reef, warming and ocean acidification could increase its energetic costs – such that the urchin will need more food than it does now to survive. If all the individuals in a kelp forest respond similarly to ocean warming and acidification, we could see big changes to the ecosystem as a whole. For instance, if sea urchins that feed on kelp start eating more, we might end up seeing less kelp within our kelp forests. Reducing the amount of kelp within the kelp forest might also impact other species that rely on kelp for food and habitat. Therefore, a change to one species' physiology (i.e., sea urchin) could impact other species within the ecosystem both directly (in this case, the kelp which is being consumed) or indirectly (by removing kelp that provides habitat for fish). In order to better understand if different species will change their eating habits in response to climate change and ocean acidification, we’ve been conducting laboratory experiments, where we manipulate environmental conditions to mimic ocean warming and acidification. We do this by constructing small kelp forest communities in large experimental tanks and monitoring how the feeding rates of different species change in response to increased temperature and acidity. These mini communities provide us a window into the future of kelp forests that could ultimately help us to prepare for future environmental change. It’s my hope that by understanding future changes, we can help to protect these bustling ecosystems and the large diversity of marine life that they support off our coastline. Emily Donham is a PhD student in Ecology and Evolutionary Biology at UCSC. Driving through the foothills of the Sierra Nevada Mountains in April delivers a show reminiscent of the paintings of Claude Monet. This April is the peak of the wildflower bloom here, and the variety of colors, shapes, and smells is intoxicating. The Sierra Nevada are at the heart of the California floristic province, one of the most botanically diverse places on the planet, and where we have come today to collect the Woodland Star flowers and their highly specialized pollinators, Greya moths. These moths depend completely on the Woodland Stars for their survival, and Woodland stars depend heavily on the Greya moths for their reproduction. Looking around at the myriad of wildflowers around us, we know that each wildflower species here depends on some pollinator or group of pollinators for its reproduction, and the future of each depends on these interactions. Unfortunately, this web of interactions is under threat right now as the climate changes. Wildflowers of the Sierra Nevada foothills (photo credit: C. Schwind). Climate change is causing species to migrate in order to remain in suitable habitat. Since some species may not move as quickly as others, and some depend most heavily on certain aspects of the climate (i.e. temperature vs. precipitation), interacting species may be pushed in different directions, and into places where they no longer interact. In the case of Greya moths and Woodland Stars, these species have slightly different climactic requirements, but because of their dependence on one another, they are limited to habitat that suits them both. Their dependence on one another therefore limits the available future range for both parties, thus reducing their ability to cope with continued climactic changes. In general, as plants and pollinators get pushed in different directions, who interacts with who will change, likely leading to reduced numbers and diversity of wildflowers in places like this, and slowly draining the color out of our painting. Dead Ponderosa Pine trees (left) due to infestation by the Mountain Pine Beetle (right). Photos: C. Schwind. Another way that climate change is affecting species interactions is by changing the context in which they interact. Here in the Sierra Nevada, there is a dramatic example. The once thriving Ponderosa Pine forests here are quickly dying due in large part to infestation by the Mountain Pine Beetle. John Muir once wrote of Ponderosa Pines, “Of all pines, this one gives off the finest music to the winds”. In all respects, these are some of the most majestic trees of California. The Mountain Pine Beetle is native to the area, and the Pines here have coexisted with it for millennia. However, the current drought in California has weakened these trees. The primary defense of the trees is to fill the holes drilled by beetles with sap. Drought stricken trees can’t make enough sap to fight them off, and the Mountain Pine Beetle populations have soared. It is estimated that California has lost at least 66 million trees since 2010. This loss is due to the changed context in which pines and Mountain Pine Beetles interact, as a result of severe drought. Rather than a direct effect of climate change, it is an indirect effect via a change in an interaction between species. As the climate continues to change, California is expected to see more severe and prolonged droughts, which will continue to change the context in which species interact. This is likely to bring about a cascade of other problems. In this case, the loss of so many pines will have enormous consequences for the communities of plants and animals that make these forests their homes. Species interactions are the glue that holds communities and ecosystems together. Our forests, meadows, and streams are not simply collections of species, much like our own communities are not simple collections of people. They are built on the relationships amongst those people. The losses we sustain due to climate change are underestimated when we only consider the direct effects on species. While some losses are now inevitable, the magnitude of loss is not set in stone. Much of this loss could be averted if we continue to push for cleaner ways to produce our energy and food. If we want our grandchildren to understand Monet’s inspiration, and the music John Muir so loved, we must protect our species and the interactions that tie them together. Christopher Schwind is a Masters Student in Ecology and Evolutionary Biology at UCSC. Between a rock and a hard place: what happens when endangered species put each other in danger? Imagine your favorite plant or animal. It can be your favorite because of you saw them in the wild and felt that they were your spirit animal, or because it plays a major part in its ecosystem, or just because it’s cool. Now think about what would happen if that favorite species were threatened with extinction. Imagine now that there is another species that eats your plant or animal that is also on the verge of extinction. What happens? Do you split them up? How would you do that? Do you save one and not the other? If so, which one? Who is qualified to make these decisions? Surely, you personally don’t have to decide. There has to be some sort of policy with very clear, specific wording to settle this. The truth is, though, there’s not. The endangered species act, or ESA, was founded in 1973 and protects species that are threatened with extinction so that they may persist through our protection and conservation efforts. The ESA clearly states that we cannot protect one species at a cost to another. However, it does not provide any guidance regarding what to do when one threatened species threatens another. Without more precise guidance, decisions regarding these types of species interactions between two protected species are made on a case-by-case basis. Things get even more complicated when you consider other legislation and policies, such as the Marine Mammal Protection Act and the Migratory Bird Act, which might have conflicting advice. One example of these challenging situations involves the Loggerhead Shrike, a species endemic to the California Channel Islands. At one point, the Loggerhead Shrike was one of the most endangered species of birds in America, partially due to the fact it was being eaten by the Channel Island Fox. The Channel Island Fox is also endemic to the islands and was put under protection by the government after being eaten by Golden Eagles. The solution: Foxes were fitted with shock collars so that if they came too close to the nests of Loggerhead Shrikes, they were shocked. This continued until the bird population recovered. There is currently still captive breeding of the shrikes on the islands, run through the San Diego Zoo. Another example of a protected species interaction involves Caspian Terns in the Columbia River Basin, who were threatened because of the high vulnerability of nesting areas to human disturbances. Due to their population declines, Caspian Terns are now protected under the Migratory Bird Act. The problem is that Caspian Terns also eat salmon at a vulnerable stage in their life cycle. Salmon are protected by the ESA, which technically trumps the Migratory Bird Act, meaning salmon conservation takes priority over Caspian Tern protection. To rectify this, the entire flock of Caspian Terns in the Columbia River Basin was moved to an island farther from the river mouth to minimize their effects on salmon, in a somewhat controversial move. For my dissertation, I am studying an unresolved interaction between black abalone and California sea otters in the Northern Channel Islands of California. Black abalone are listed as endangered under the ESA. They went through a mass mortality event caused by a disease that affects the abalone’s stomach, such that they essentially starve to death. Abalone attach to rocks using their stomach/foot. When they are weak from starvation, they fall off and die. This disease wiped out roughly 90% of the populations in some areas, and they still have not fully recovered. Now what could sea otters have to do this? Sea otters are listed as threatened under the ESA. This was due to their being hunted to near extinction. Sea otters are now recovering and moving south from Central California to reestablish their historic range, including the Channel Islands. This is the same area where black abalone populations are still recovering. If sea otters move into the Channel Islands, the recovery of black abalone could be at risk. This brings us back to our policy conundrum. Both of these species are threatened and the law requires that we protect them both. But helping otters could put black abalone at a disadvantage. How can this be resolved? Technically, abalone have the advantage in this situation because they are listed as endangered. This means that they are at a higher risk for extinction than otters, who are classified as threatened. As much as policy makers are able to take this into account to make unbiased decisions, it is likely that human emotion could influence policy as well. Many people have personal connections to widely beloved species such as otters, which can make it difficult to be impartial. Having an objective framework to solve this management issue and others like it will become increasingly necessary to maintain populations of species that can survive on their own. As part of my dissertation, I will be trying to find all examples of conflicted species interactions involving threatened or protected species in scientific papers, judicial cases, and the public news. This will be used to determine what commonalities exist in the handling of these situations, what works, and to help provide guidance to managers and policy makers. Given how many species around the world are listed as at least threatened in some way, the number of options for how to manage these species interactions seem endless.